Starting from right now until 00:00 Monday 17th December, if you buy a PC from us with either a Gigabyte Motherboard or Graphics Card inside, you can be entered into a prize draw to win your money back (up to) £1500 in cash into your bank. We'll draw the winner on Tuesday 18th December and it'll be with you within 2-3 working days. The Graphics Card part is a bit different if you're looking for a branded Graphics Card, you'll need to find a PC in our listings that you are able to configure. Below is an example of one that can be, the button is located under the price section on the right. 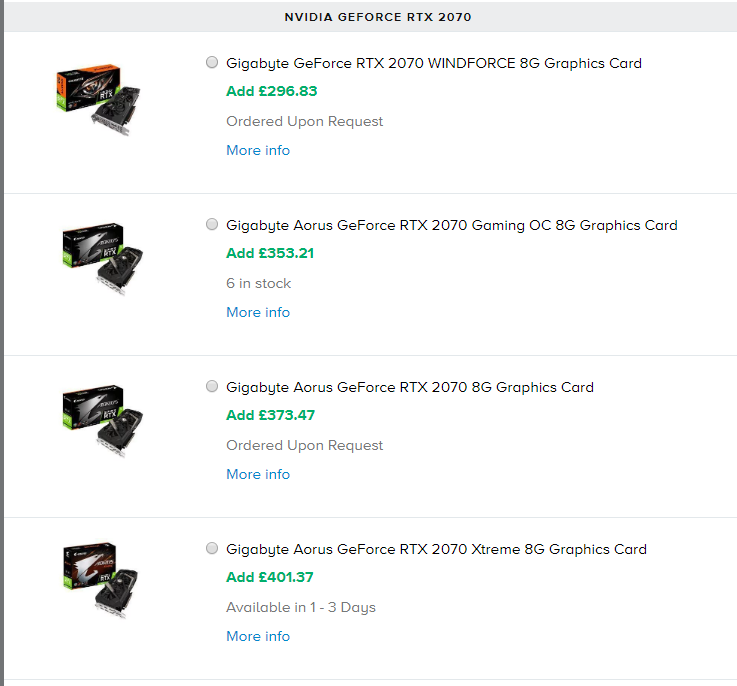 Here you'll be able to view all of the Graphics Cards you can upgrade to, you might be changing from the GTX 1060 above to an RTX 2070 so if you're choosing a Gigabyte Graphics Card your PC qualifies to enter in to this promotion. A few rules, if your PC is over £1500, you'll only get up to £1500 back, not the full value of the PC. If your order has a PC worth £800 and £200 of peripherals with an order total of £1000, the refund only covers the value of the PC so the money you get back will be £800. PC orders can be done online, in-store or via our Telesales team. Retail Customers only, no Business Account orders. No action is necessary on the customer side, we will draw a winner. Prize is non-transferrable and must go to the bank account of the name of the customer on the order. Prize is for £1500 transferred to winning customers' bank account, no product equivalent is available. Closing date is 23:59 on Monday 17th December (UK time). The winner will be contacted on Tuesday 18th December.